Our tour guide will meet and greet you upon arrival at Noi Bai International Airport. Transfer to the city for hotel check-in. We will have short sightseeing tours to see some landmarks of Hanoi City (If you arrive in the morning or early afternoon). The rest of evening you will be free at leisure by your own. Overnight in Hanoi City. After having breakfast at hotel, we will drive to Hoa Binh, it is 60 km from Hanoi City. 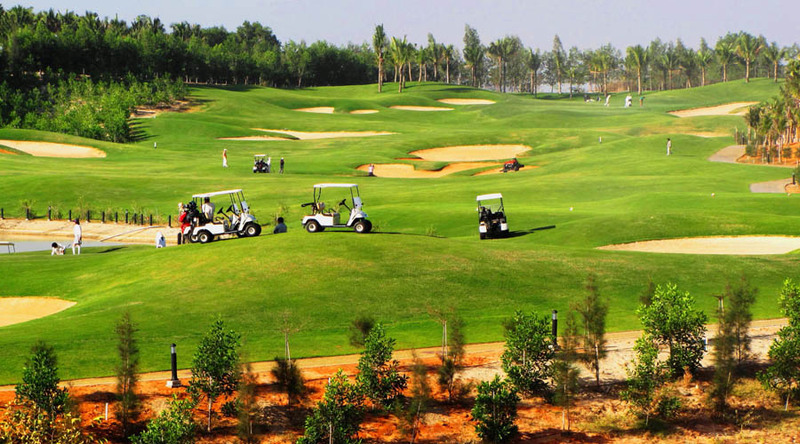 Start the day with a round at the Phoenix Golf Resort, is the biggest golf resort in Northern Province of Vietnam with total 54 holes(03 Courses) opened on 30th November 2006. In the afternoon, take a short drive to visit Hoa Binh hydro power station. Back to Hanoi. Take the day off and discover the Halong Bay, a must-see destination. Morning depart for Halong Bay, we go through the scenic countryside. The wondrous Halong Bay is truly one of Vietnam’s most impressive scenic sights. Heading out of the town we embark on a boat for an exploration of the legendary Halong Bay. This exciting five hour cruise will provide us a fantastic view of the picturesque scenery blending with the sky and some 3,000 limestone islands rising amazingly from the clear and emerald water. The limestone karsts formations are littered with beaches, grottoes and beautiful caves. Along the way we will anchor for a leisurely swim in a secluded cove and an enjoyable visit to one of the many hidden grottoes beneath towering cliffs. Transfer back to Hanoi. Stay overnight in Hanoi. – All gratuities and tips to driver and tour guide.